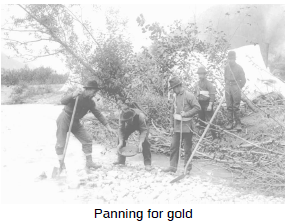 1890s - The Klondike Gold Rush was in full swing. By 1900, Dawson City, Yukon was the largest city in Canada west of Winnipeg. The promise of fortunes to be made attracted tens of thousands of prospectors, merchants, dance hall girls and gamblers. 1890s - A change from wooden ships to iron steamships put an end to the once-flourishing shipbuilding industry of the Maritimes. 1895 - Electrical power started to be generated from the falling water of Niagara Falls making cheap power available for industry and homes. The first time in the world that hydro-electricity was used to power a plant was at John Barber's paper mill in Georgetown, Ontario in 1888. An electric stove was first demonstrated in Ottawa in 1891, but with the harnessing of Niagara Falls in 1895 and the development of long-distance power transmission in 1897, hydro-electric power became available for widespread use. Adam Beck of London, Ontario helped establish Ontario Hydro, the first publicly owned electric utility. He has been called the father of hydro power in North America. 1899 - The Boer War broke out in South Africa. 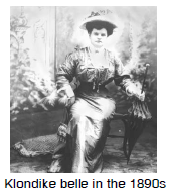 This was a battle between the British residents of Cape Colony, mostly gold miners, and the Boer settlers of the Transvaal and the Orange Free State who were primarily farmers. 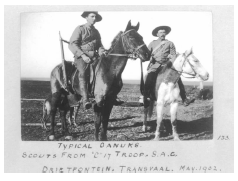 The Boers, or Afrikaners, were descendants of the original Dutch settlers in South Africa. In the 1890s the imperialist spirit was strong, especially in Britain, and the British jumped to support the British South Africans assuming that all their self-governing colonies like Canada would follow. The Canadian prime minister, Sir Wilfrid Laurier, first responded by stating on October 4th, that the South African situation posed no threat for Canada and, since parliament wasn't in session, the Canadian government couldn't send an official contingent of soldiers, anyway. The country, as usual, was split, as was Laurier's cabinet. The English wanted to support the British war. The French did not. In fact, they felt more sympathy for the pastoral, religious Boers who were seen as the objects of imperial aggression. Laurier finally fashioned a compromise. The Canadian government would pay the costs of outfitting and transporting a contingent of 1000 volunteers. Once there, however, they would become the responsibility of the British. In all, 7300 Canadians went to South Africa, of whom 245 died. The same conflict between French and English arose during the conscription: the compulsory enlistment of men into the armed services by an act of law.conscription crisis of the First World War (see Military Service Bill, below).